The abdominal muscles aid in the process of respiration as well as provide structural support to the abdominal cavity and protect the abdominal organs. There are four major muscles that support the abdominal wall; they are external abdominal oblique, internal abdominal oblique, transversus abdominis, and rectus abdominis. Many people who desire a flat and toned stomach are not able achieve it with diet or exercise alone. Tummy tuck or abdominoplasty is a procedure which removes excess skin and fat from the abdomen and tightens the abdominal wall muscles to restore a firm and toned abdomen. Tummy tuck is suggested for people who have good overall health, but are worried about excess skin and fat deposits on their stomach that do not respond to lifestyle modifications. A tummy tuck can be performed on men and women who have gained or lost a lot of weight resulting in excess fat or loose skin. It can also be beneficial to women who have had multiple deliveries, causing loose abdominal wall muscles and excess skin around their midsection. A tummy tuck may not be advisable if you are planning for a future pregnancy and should only be considered when other weight reduction methods such as diets and exercise are unsuccessful. Before your procedure, a detailed medical history is obtained, and a thorough physical examination is performed. During your consultation, your doctor will advise you to stop smoking, if you smoke, so as to avoid post-surgical complications and delayed healing. You should eat a healthy diet and avoid any restrictive dieting during this time. You should inform your doctor of all medications that you are taking on a regular basis. 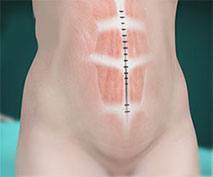 Tummy tuck is performed under general anesthesia. 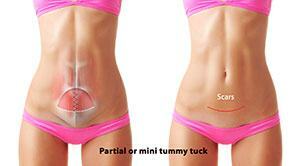 There are two types of tummy tuck procedures: complete and partial or mini. Complete tummy tuck is one where a long incision is made from hipbone to hipbone along the bikini line. The abdominal wall muscles are tightened, excess skin and fat are removed and the belly button is moved up. Partial or mini tummy tuck removes pockets of excess fat and tightens the abdominal muscles below the naval. It can be done with a much smaller incision than a complete tummy tuck. The belly button will usually not need to be moved but depends on the case. The incisions will be closed with sutures, and a drainage tube may be placed, to drain out fluids. Tummy tuck can also be performed by a less invasive procedure called Endoscopic tummy tuck. In this procedure, your surgeon inserts a lighted camera called an endoscope through a tiny incision. Images taken with the camera will be displayed on a large screen, which will guide the surgeon during the procedure. Tiny surgical instruments are inserted through other small incisions over the abdomen for your surgeon to carry out the procedure. After the procedure, medications will be prescribed to relieve pain. You will be advised to rest with your hips and legs bent to minimize pressure on the stomach. You will wear a firm elastic bandage for extra support around the abdomen. Most patients are discharged 1 to 3 days after the surgery, and instructed about proper wound care at home. After the stitches are removed, do not expose the area to the sun. Scars will become lighter and flatter in 3 to 6 months. Strenuous activity is prohibited for the next four to six weeks or until the wounds heal. You will be able to resume work in 2 to 4 weeks. 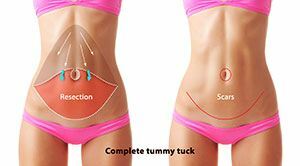 Tummy tuck is a relatively safe surgery. 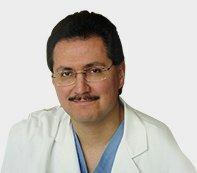 However, as in any surgery, there are chances of potential complications including bleeding, blood clots in the lungs or legs, insufficient healing, scarring, and infection.